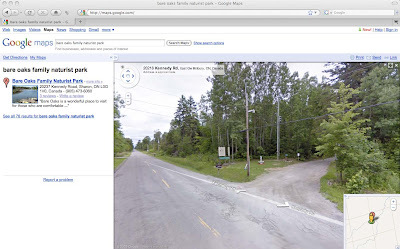 Google Maps' Streetview has been expanded and now goes right past Bare Oaks Family Naturist Park. From the looks of things, it was taken last summer. It will make it even easier for anyone trying to find their way to the park. To see it, just click here. Streetview is also embedded into this blog post right below this paragraph. If you can't see it, it might be an issue with your browser or that you are reading this using a blog reader or email program.